Finding the best lighting for your home can be challenging, especially if you don’t know which type of light fixtures will best accentuate the look and feel of your home’s interior. From wall sconces and accent lighting to standing lamps that provide ambient light throughout your living space, there are an endless amount of choices that can help elevate the look and feel of your home. That’s why, in today’s article, we’ll be taking a look at some of the best light fixtures for the modern home that can be found at Distinctive Lighting’s showroom! For more than 30 years, Distinctive Lighting has remained as the best lighting company in Bozeman and the surrounding areas of the Gallatin Valley. We know that no two homes are alike, which is why we work directly with our customers to help them find the ideal light fixtures that can bring their home to life. From ceiling fans to a wide selection of outdoor lighting options, you can find everything that you are looking for at Distinctive Lighting’s showroom in Montana! 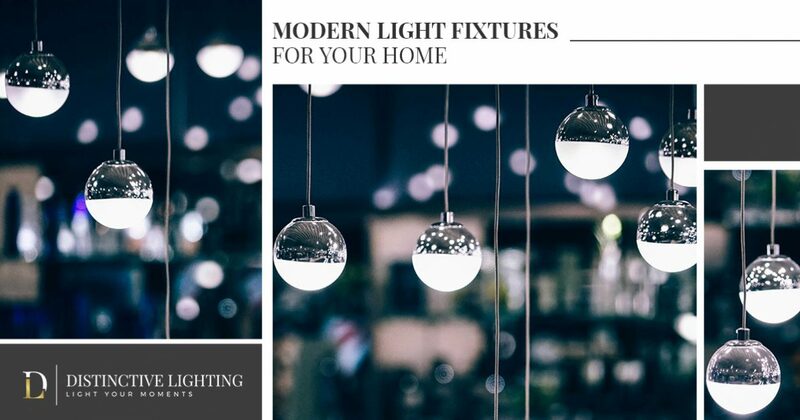 To learn about some of the best modern lighting options for your home, continue reading more on the topic below! Pendant lighting is an exceptional choice for nearly all types of homes, as homeowners can choose from mini pendants, large pendants, crystal pendants, and so much more. In more recent times, pendant lighting has been effectively used in kitchens that feature breakfast bars or island countertops, however, this type of lighting can also be placed over dining tables, bathtubs, and so much more. An easy way to upgrade the look and feel of your cabinetry is by simply adding soft undercabinet lighting to be used as either task or ambient lighting. Not only will this make it easier to navigate throughout your home at night, but it can also help to provide an additional source of light while prepping your meals or doing dishes! Although sconce lighting is a timeless light fixture that is used in almost every home, there are a number of ways that this type of light source can take your home from traditional to modern. For example, many sconce lights are ornately detailed, giving them an upscale, yet dated look. By replacing your sconce fixtures with a style geared towards modern times, such as a sleek metal fixture, you can do much to improve the look and feel of your home with ease. These are just three different types of lighting options that can help you bring your home to life. If you have any questions or concerns, or if you would simply like help finding the best lighting fixtures for your needs, consider reaching out to the lighting professionals today at Distinctive Lighting! With one of the largest lighting showrooms in Montana, we continue to offer the most diverse selection to our customers, so that they can find the perfect task lighting, ambient lighting, and pendant lighting products for their needs. Contact our friendly staff today to learn more!